“We are so thankful for the National Endowment for the Arts and the community giving us the opportunity to celebrate dance. We will be engaging the community in the arts and paying tribute to artist Jesus Moroles with the unveiling of a memorial sculpture in his honor. 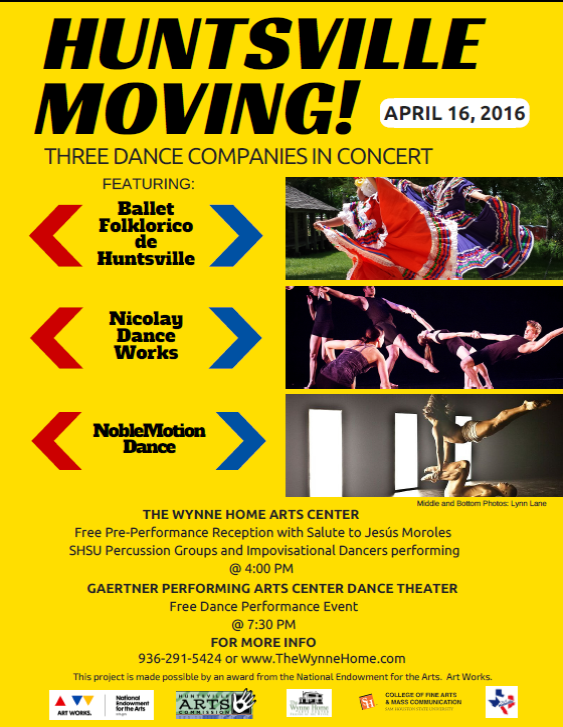 Along with hearing an original piece from the SHSU Percussion Band accompanied by improvisational dancers. What a great day it will be!” said Linda Pease, Cultural Services Coordinator. This Saturday, April 16 please join us for Dance and Musical Performances with a Pre-Performance Reception at The Wynne Home Arts Center @ 4pm and Gaertner Performing Arts Center Dance Theater @ 7:30pm! These are FREE events and open to the public!